Registration has started! Click over to the registration page and sign up for competitions now! From the humble start 4 years ago, Maithry Utzav has been recognized as one of the premier fine arts competitions in the San Francisco Bay Area! This year, we will have the event spanning two days! 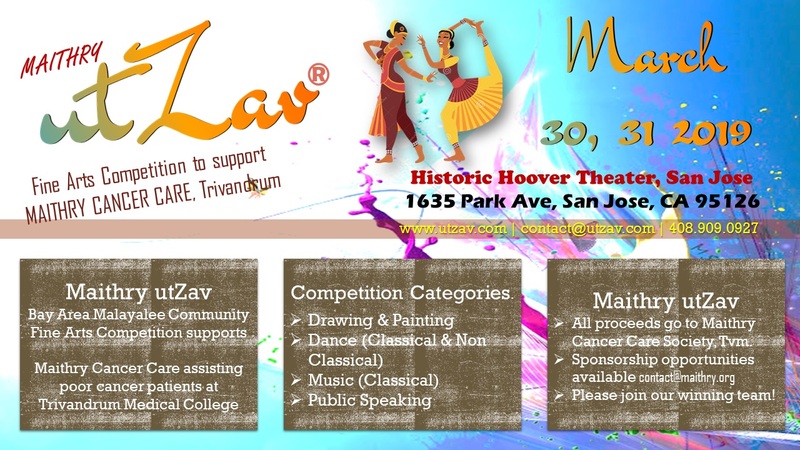 Music and art competition on Saturday March 30th, and Dance competitions on Sunday March 31. We invite you to join us at Utzav 2019 - the event that provides one of the most supportive and confidence-building environments, with 100% absolute integrity! We need volunteers in all areas. This is a great opportunity for the youth in our community to earn service hours! Be sponsor! You may also share with us the details of a business who can benefit from being an Utzav-sponor! Please share this note on your Facebook wall. Please copy/paste this note and send to your contacts, thus encouraging them to participate. Please register the artists in our families to participate in various music, dance, public speaking, and art competitions. Do encourage your friends to participate!